J. Ellen Long, PE, LEED AP worked for a national architectural and engineering firm that provided services across the country for Home Depot’s national expansion program. Chick-fil-A, which was also preparing to expand nationally, sought similar services from this same firm. Chick-fil-A sought out Ellen in 1997 to lead the civil engineering related to their national expansion program. To facilitate this, she established Long Engineering and Chick-fil-A provided her with everything she needed for a home office as well as provided her with office space at their corporate headquarters. Ellen’s responsibilities were to interview, select and train regional civil engineers throughout the country, set up regional design standards, provide quality control and value engineering on each site and coordinate with the development and construction managers. In 1999 she hired her first employee and soon had to find office space in Atlanta to accommodate her firm’s fast paced growth. The firm only offered Land Development services but in 2001 expanded to provide Land Surveying and in 2002 added Transportation Engineering. She opened offices in Norcross and Savannah, Georgia and in Nashville, Tennessee. The Norcross and Nashville offices supported further expansion of the Land Surveying and Transportation Engineering efforts, while the Savannah office was prompted by new Land Development projects located in the area. The growth was so fast that the firm was recognized as one of the top fastest growing A/E/P firms in the U.S. by the Zweig Group in 2004, 2006, 2007, 2008 and 2009. In 2010, Ellen sold the Land Surveying and Transportation Engineering offices in Norcross and Nashville to a national transportation engineering firm. Overnight, the 70-person firm became a close-knit group of about 10 people, once again providing only Land Development services in the Atlanta office. In 2012, she decided to again grow the firm and the services it provided. She added staff to enable her to offer Land Surveying and Transportation Engineering once again but also to add Bridge Design, Construction Engineering and Inspection (CEI) and Subsurface Utility Engineering (SUE). And once again, her firm was recognized by the Zweig Group in 2015, 2016 and 2017 as one of the fastest growing A/E/P firms in the country. A Birmingham, Alabama office was added in 2017 to again support the growth within Transportation Engineering. In 2018, Long Engineering was again recognized as a Hot Firm, this time coming in at #24, as well as being named as one of the Best Firms to Work For. This was all achieved through organic growth. Today Long Engineering has over 110 professional, technical and support personnel located within their three offices. As the firm has grown, it has remained focused on their employees, clients, and commitment to doing the best job they can on every project they undertake. 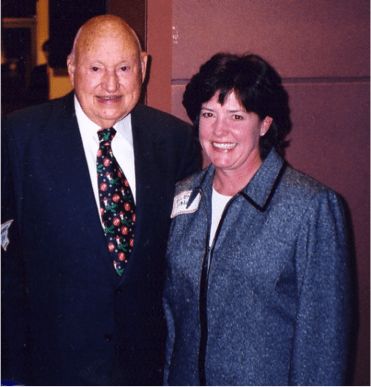 1997: Ellen with Truett Cathy, Founder of Chick-fil-A. 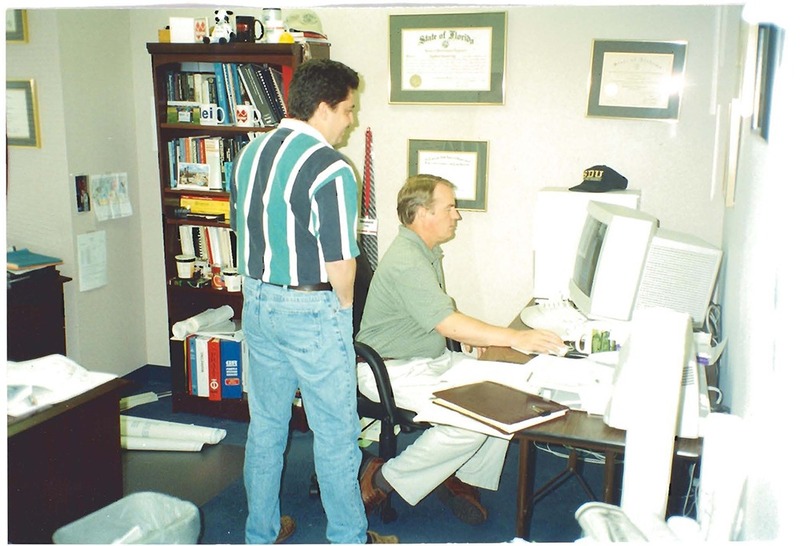 2002: New employees, new offices. 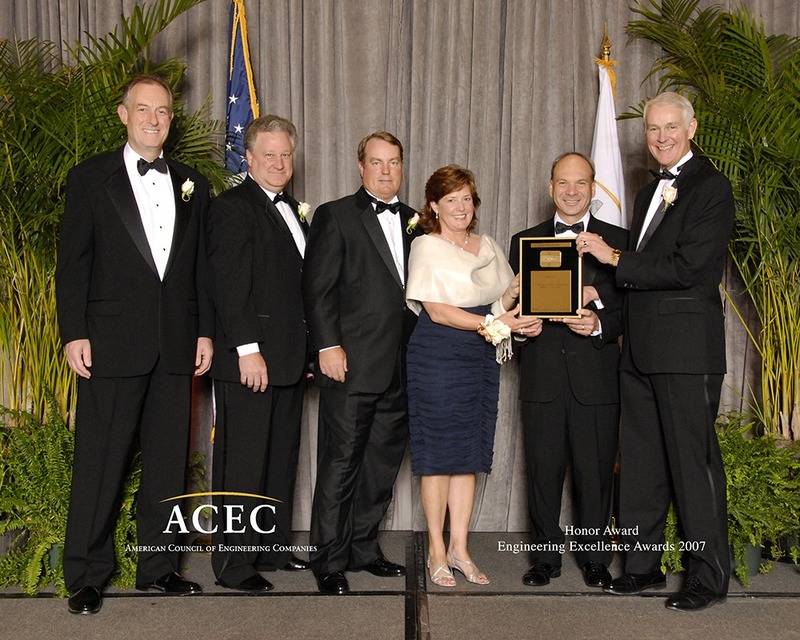 2007: Ellen accepting ACEC Honor Award for Sweetwater Creek State Park Visitor Center, the first LEED Platinum building in the Southeast. 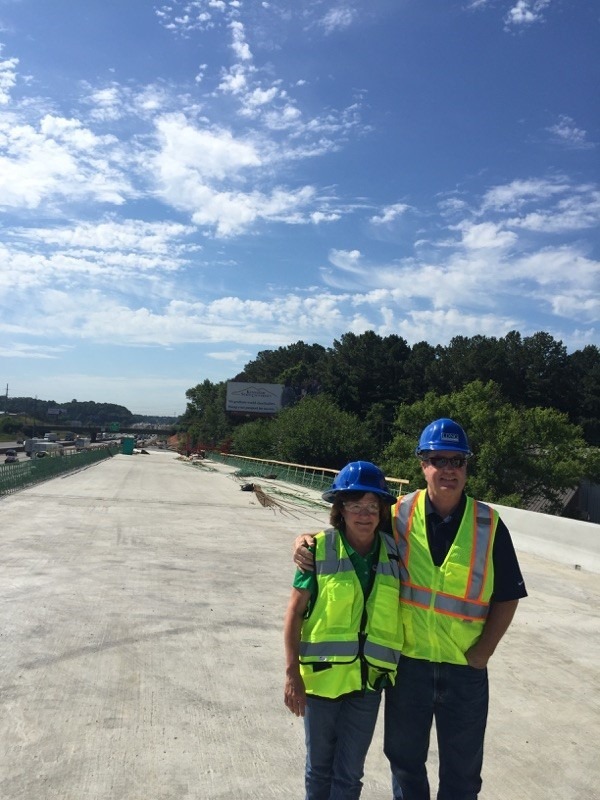 2017: Ellen and Shepherd Long touring the construction of the Northwest Corridor Express Lanes, Cobb County, GA.